Greek food writers have laid claim to inventing the precursor of bouillabaisse. They argue that when the Phocaeans, Greeks from Asia Minor, founded Marseilles in about 600 B.C. they brought with them a fish soup known as kakavia that was the basis to the future bouillabaisse. This can be said to be true only in the most general (and meaningless) sense. In fact, we have no idea whether such a soup was �brought� to the western Mediterranean. In the culinary writings of the ancient Greeks, especially as represented by Athenaeus (A.D. 170-230), there are many mentions of boiled fish, cooked in unspecified ways, as well as one fish stew made with grayfish, herbs, oil, caraway seeds, and salt. The most likely precursor to the Proven�al bouillabaisse is likely to be an Italian fish stew and, in fact, the closest thing to a bouillabaisse that I have found in a medieval text is the brodecto de li dicti pisci that appears in an anonymous fifteenth-century Italian cookery book from southern Italy where sardines and anchovies are boiled in vino greco (a strong Neapolitan wine) with black pepper, saffron, and sugar with a little olive oil. There is also the matellotte du poisson recipe found in Jourdain Le Cointe's La cuisine de santé published in 1790 that Alan Davidson, author of Oxford Companion to Food believes is a relevant precursor. But given the obviousness and simplicity of boiling fish one cannot point to one location as a place of origin. One of the earliest uses of the word bouillabaisse was in the 1830s as a term expressing the rapidity of the cooking. Stendhal mentioned bouille-�-baisses, perhaps referring to a fish stew, in his travels from 1806. But the famous French chef Raymond Oliver, writing in the Gastronomy of France, makes some extraordinary claims about bouillabaisse. He tells us that it is first mentioned in a dictionary from 1785, that its heritage is Phoenician via Greek Sicily, and that the rules for the making of bouillabaisse were laid down in the sixteenth century. I agree with his estimation that �in 'bouillabaisse'..., it is essential to retain all the delicacy of the fish and never to debase through too much zeal a symphony of tastes which is so hard to achieve.� The dictionary Oliver must have been looking at from 1785 was pointed out by Daniel Young in a response to a letter to the editor from me published in the Los Angeles Times on October 6 and 29, 2004. He tells us that in Claude Fran�ois Achard's Dictionnaire de la Provence et Comté-Venasissin the word bouilhe-baisso is defined as "a fisherman's term, a sort of ragout consisting of boiling some fish in seawater." This may be so, but this is a far cry from the bouillabaisse we know of today with its saffron, fennel, orange zest, and Pernod and expensive fish such as rascasse (scorpionfish). Strong opinions about the proper bouillabaisse are typical from its proponents such as the French writer and gourmet August de Croze who said it is a culinary heresy to use white wine in a bouillabaisse because wine only changes the nature of the fish. Others, including myself, disagree; it is natural. But I agree with everything else he has to say: live fish in great variety, good olive oil, saffron, and furiously boiling water (the most critical step) are all essential for a successful bouillabaisse. 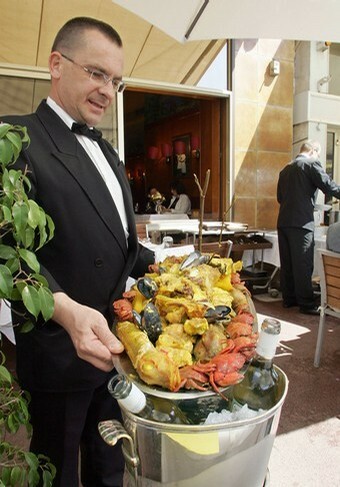 So how did bouillabaisse originate? I mean here the fancy version, not the fishermen's fish boil. My guess is that, given all the hallmarks, it was the invention of a nineteenth-century restaurateur of Marseilles. Because of its expense it most certainly was not an invention of the fishermen although it was the fishermen's fish boil, with the name after all, that was the precursor.